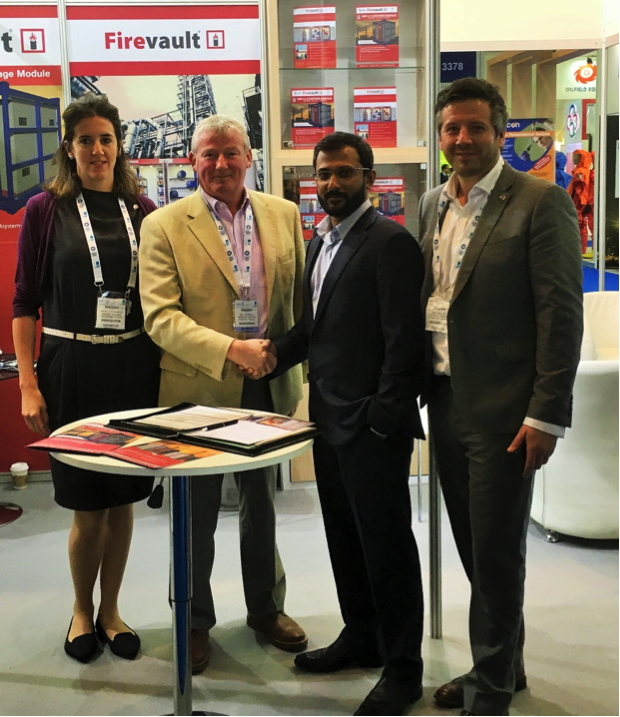 Firevault Systems is proud to announce new business exceeding £500k of sales of their new onshore Hazardous Materials Safety Stores, a contract secured during last week’s ADIPEC conference in Abu Dhabi. In partnership with their region based partners BIEWU International, Firevault have secured repeat business from RasGas in Qatar and have design approval from ESNAAD Oil Spill Response Marine division. Firevault Systems was representing Ireland at the highly successful Enterprise Ireland stand – a showcase for Irish companies gaining a foothold in the region. After obtaining its first contract in the region for 2015, Firevault has massive plans for expansion for 2016 and onwards. ADIPEC provided key market insight and provided the ideal platform to launch its new range of products and services. Neil O’Carroll, MD Firevault Systems, signing contract with Riaz Adam, BIEWU International. “We are delighted with the response we have received this week at ADIPEC. We have been able to connect with our target market and also at the right level. I believe this conference will be the stepping stone for Firevault Systems to make lasting relationships and to continue our growth in the region.” Mike Brodie, Director, Firevault Systems. Firevault was approached by potential new distributors and rental companies which again provided valuable information on the most suitable routes in the region. For over 23 years, Firevault’s parent organisation Chemstore Group has been a market leader in hazardous material storage in the UK and Ireland, offering a complete engineered solution; providing site assessments, designing and fabricating bespoke solutions and also offering specialist consultancy and training services. Firevault Systems has now emerged as a premium subsidiary of the group and is pioneering in its endeavours to provide the highest level of safety for all organisations when handling, transporting and storing flammable materials in the most dangerous environments. 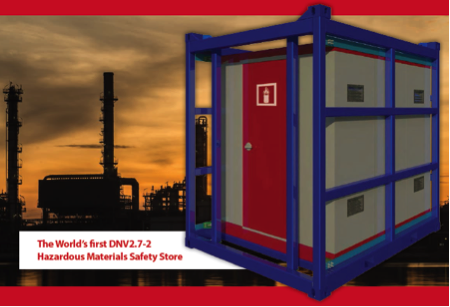 Firevault have recently gained certification to build the world’s only fully DNV 2.7-2 certified Flammables Safety Store. This marks the culmination of 18 months of research and development, testing and certification. This Firevault can be used onshore or offshore and be placed within Zone 1 or 2 flammable atmospheres. The level of certification allows operators and contractors to place hazardous materials exactly where required, thus reducing operational costs, downtime and risk. Firevault has also successfully delivered the first of a batch of onshore designs, supplied to RasGas in the Ras Laffan region, Qatar. This project involved our engineers working closely with the client in order to reach a customised design that met all of the site specific requirements. The solution provides a centralised and easily managed location for all hazardous materials, flammables and oils. The store is supplied with an Atex-rated air conditioning system to address the high ambient operating temperatures, is fully 90-minute fire rated and is fitted with internal lighting. The store was delivered to site pre-fabricated and ready for immediate use once it arrives. Contact one of our specialist engineers today.